Today I upgraded Movie Reviews WordPress Multisite blog to WordPress 3.2. All went through smoothly. I can add an image, Image upload works but after that nothing works and Image Lightbox is stuck. Edit Image is not working. If I try to edit existing image then it shows the Edit Image lightbox pop up window but it doesn’t allow any further operations. 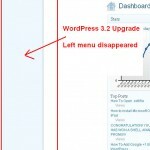 I started this blog with WordPress MU initially and have been upgrading to the subsequent upgrades. I never had any issues with it in the past. I did a Google search and couldn’t find any discussion on Image related problems in WordPress Multisite. I did some typical basic activities such as cleaning the browser cache, trying it in different browsers, re-upgrading WordPress 3.2 but none of solutions has worked so far. Cleaned WP Super Cache too but no luck. Next is to uninstall the plugins and check if it works. Got it working now, I disabled all the plugins and viola it works, I can Edit the image now. Next is to narrow down on which plugin is causing Add An Image problem in WordPress 3.2 Multisite. Oh dear! it is chaos now. The entire site doesn’t work. It seems it is using a function which is coming from a plugin. I commented this line function call in header.php but it gave error for next function. It seems all functions with bp_ suffixes are not working. It turned out that I’ve been using BuddyPress themes and when I deactivated BuddyPress plugin it didn’t work. So bring everything back to normal, I activated plugins again and it is back to square one with image problem. I’ll try again by disabling plugins one by one. Ok next update, it is not the plugins but the theme causing problem. I deactivated BuddyPress theme and activated default Twenty Ten theme and I can see the image options are working fine now. The next step is to get the upgrade of the theme I’m using and try to compare the changes as I’ve heavily customized the theme. To sum up if you face similar Image problem in WordPress 3.2 Multisite then check your BuddyPress theme, problem lies there. I’ve the same experience for my wpmu site. I also used buddypress theme from premium wpmu dev. Still no solution with the theme. It would be better if you can show up a guidance to fix it. I couldn’t find any solution yet. The temporary solution is to change the theme to default one insert image and change theme back to original. Thanks for doing this detective work. Sadly I have the same problem. Don’t wanna change my theme. waaaaah!